Just look at this picture CNN is using of Anderson Cooper. ...Can we just be clear how ridiculous it is to have a photo like this taken of yourself? Is there anyone who can look at this and not laugh? Who would possibly allow this to be used publicly? 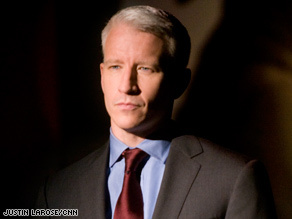 Anderson Cooper, the greatest man alive, that's who.